The tag was added to the front with personal details and washing instructions on the back. 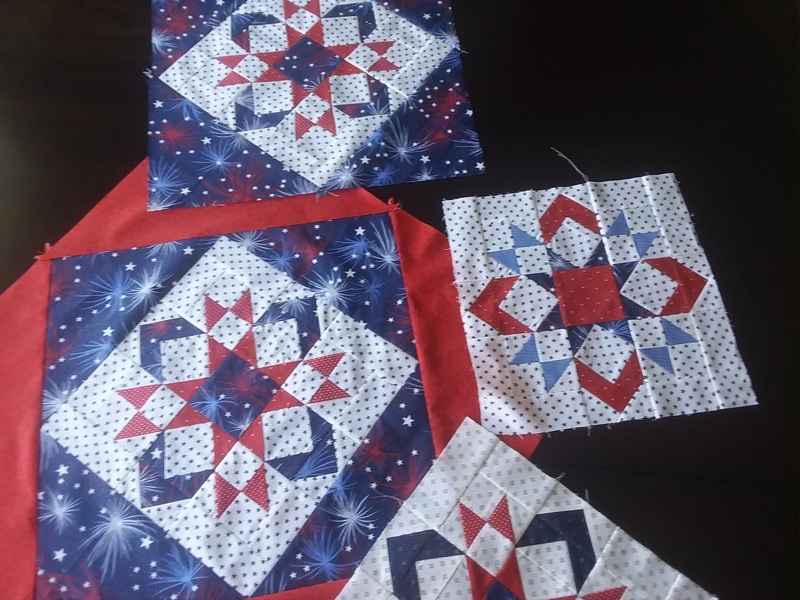 These patriotic items have been in the works since May. 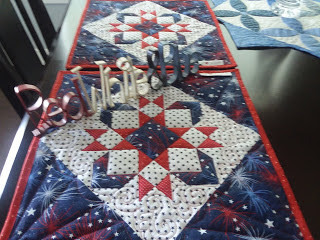 This block is from a Spectacular Star Table Runner free tutorial from Lindsey Weight at The Fort Worth Fabric Studio Blog. She truly has so many beautiful and wonderful tutorials that I plan to make someday! I was going to make the Spectacular Star Table Runner but then decided to add triangle borders and make multiple table toppers or wall hangings to share. Pattern revision notes for future reference. 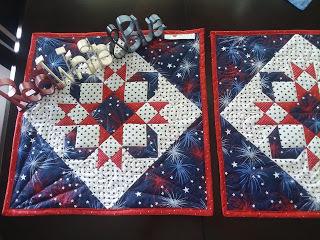 Make all the units as shown below and lay out into this configuration and sew together. 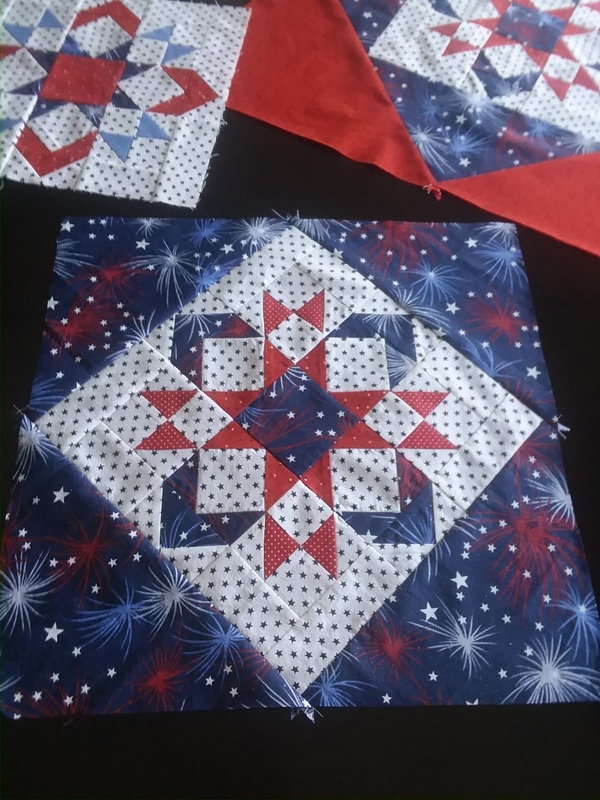 The center of the star is a 3 1/2" square. 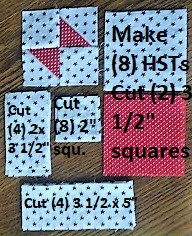 To make the corner units: First make (8) Half Square Triangles (hst's). 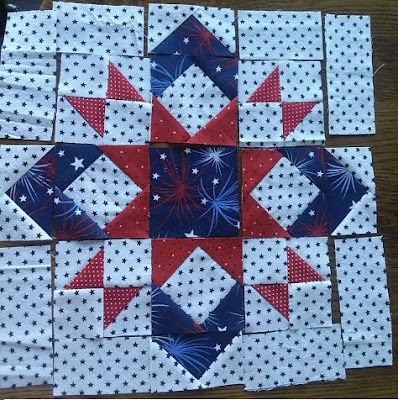 Place the red and white 2 1/2" squares right sides together. 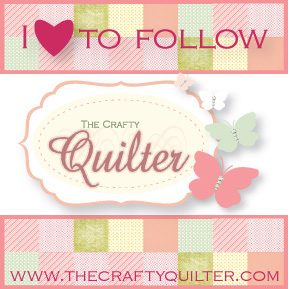 Sew around the perimeter and then cut diagonally twice. Press open and square up to 2". 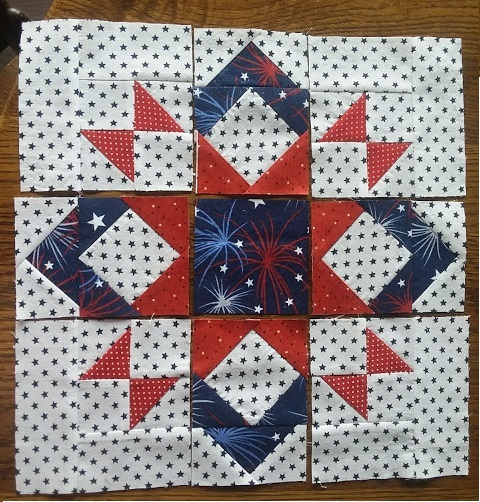 Sew the bow tie block by sewing the HSTs with the 2" squares as shown. Square up to 3 1/2". 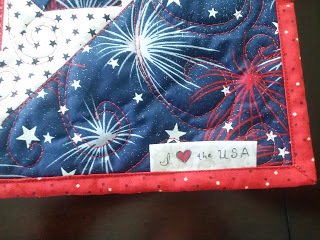 Then sew the borders on as shown above in previous photo. 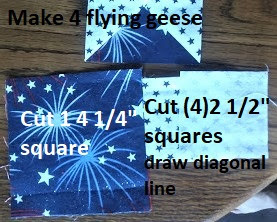 Make 4 flying geese. Cut (1) 4 1/4" square and Cut (4) 2 1/2" squares. Draw a diagonal line on each 2 1/2" square. Use the flying geese no waste method here. Make 4 of these units. 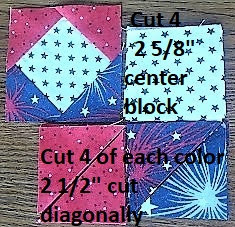 Cut (4) 2 5/8" centers and to create a square in a square, Cut (4) of the two colors 2 1/2" squares and then cut in half diagonally. Sew triangles to each side of white square as shown. Square up the unit to be 3 1/2"
After sewing all the units together, square up the unfinished block to 12 1/2"
Your fabric choices are fantastic - I especially like the fireworks! That block is really quite lovely. Your fabric choices really make it come to life. I am going to bookmark this post because I so appreciate the tutorial. You make it so clear.